You are here: Home > Blog > Flora & Fauna > The colours of autumn leaves, and fruits. It is now ‘officially’ Autumn, the leaves of deciduous trees have ‘done their job’. Their photosynthetic abilities are in decline as winter is not conducive to photosynthesis and growth. Low temperature and low light intensity mean that metabolism slows right down. The leaves of a tree become a liability in that they would make use of the reserves that the tree has stored away for hard times, plus the leaves offer resistance to the winds of winter so a tree is more likely to sustain damage (see video clip below) - branches ripped from the stem or the tree may even be uprooted. So the leaves are ‘discarded’ but before that happens they change colour. The green colour of the chlorophyll is lost and a variety of other colours emerge - reds, oranges and yellows. These colours are associated with different pigments, the carotenes, xanthophylls and the anthocyanins. The anthocyanin can join up with sugars giving a red colour (like that seen in an ripening apple). The carotenes and xanthophylls are yellow and orange but these colours are usually masked by the green of the chlorophyll. As the chlorophyll in the leaves begins to break down so the yellow and orange pigments begin to show through. The carotenoids (like β-carotene) absorb light in the visible region of the green/blue spectrum, so the yellow and red wavelengths are reflected back to us - giving an orange colour. At the same time as these colour changes occur in the leaf, so other changes take place. At the base of the stalk of the leaf (petiole), a special layer of cells forms (the abscission layer). Here, the cells begin to 'round up' and begin to lose contact with each other. The cementing material between the cells begins to weaken so that the leaf will eventually fall from the stem. Its detachment leaves a small scar; the shape and form of these leaf scars is one way in which winter twigs of different trees may be identified. Some trees, like the Maples, Sumacs and Dogwoods, have particularly bright autumnal leaves; they contribute to "The Fall" in New England is often spectacular. The leaf colours are particularly intense where and when the weather is cold, dry and bright. The carotenoids are not only found in dying leaves, but are also responsible for the colour of many fruits and vegetables. β-carotene is abundant in carrots, but is also to be found in nectarines, apricots and pumpkins. Deep green vegetables like broccoli and spinach are also good sources of β-carotene - but as has been mentioned above the “orangeness” is masked by the colour of chlorophyll. The bright colours of fruits are to attract animals which help disperse the fruits (and their seeds); just as these colours in flowers attract pollinators. Yellow, orange and red colours are seen in many peppers as they ripen. They contain a number of carotenoids : such as β-carotene, lutein, violaxanthin, capsanthin and capsorubin. The last two are specific to peppers and give rise to the red colour. Purple or black fruits result from the presence of various carotenoids with significant amounts of chlorophyll. A pale cream / ivory coloured pepper occurs when the chlorophyll in the fruit is broken down. 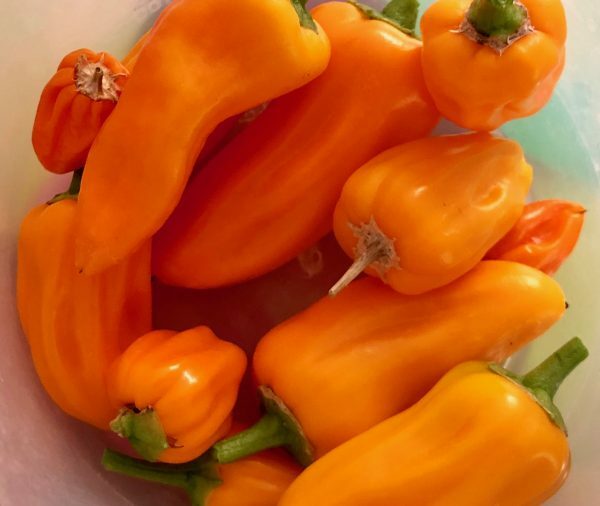 Red and orange coloured peppers are a good source of Vitamin A. 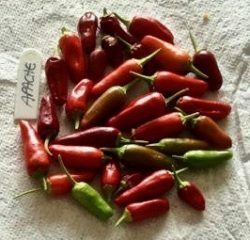 Thanks to Pam Symons for multicoloured chillies jpg. 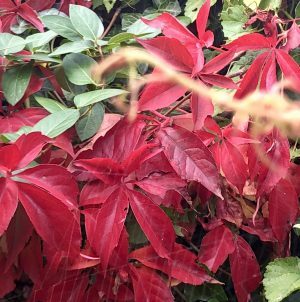 Fascinating article which touched on all aspects of the phenomenon of autumn colours. Understanding the science behind the transformations adds much to all the aesthetics. Thank you. 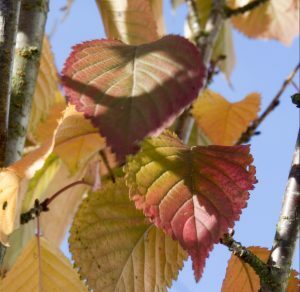 Changing Colours – Why do leaves change colour in the autumn? Autumnal colours and leaves of gold.